There are few activities I appreciate more than going to a restaurant for dinner...or lunch...or breakfast. Basically if I get to eat food that somebody else has prepared, I'm happy. If it's a vegetarian restaurant, where I have a whole menu of things to choose from, it's even better. 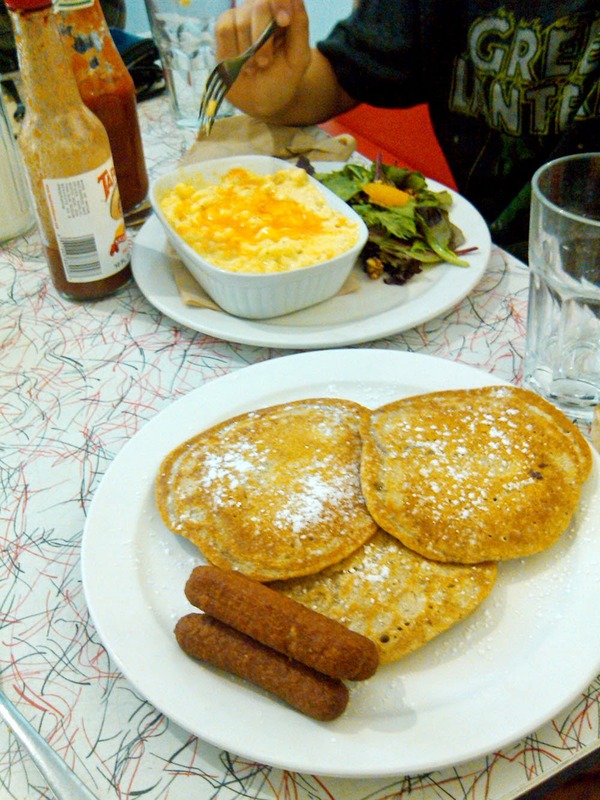 So it was with our recent visit to Sadie's Diner in Toronto. As I said on What I Ate Wednesday, I was attracted to their menu of vegan and vegetarian comfort foods. I figured the familiar-sounding foods would appeal to the kids as well. My son, as he tends to do, complained the whole way there that the restaurant probably wouldn't be any good. He changed his tune when he saw the Pez wall. 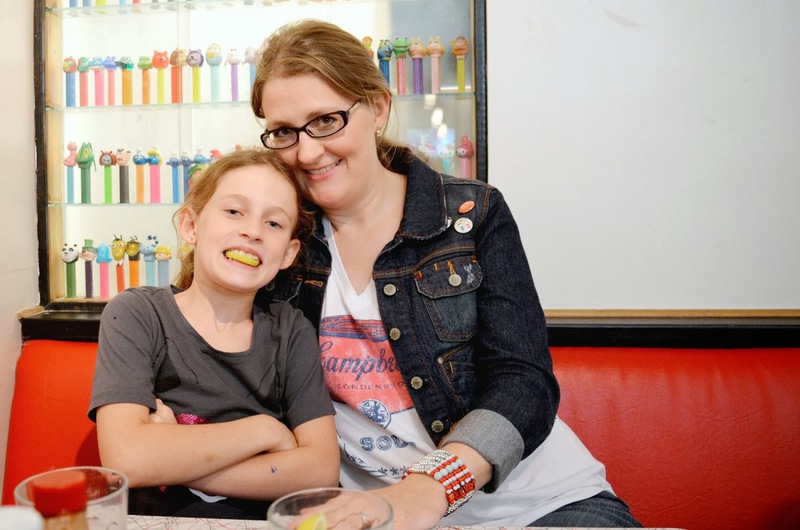 If you visit Sadie's Diner, be sure to sit in front of the Pez wall. It serves to occupy the kids (and the adults) for quite a looong time. That's always good at a restaurant where the children may embarrass you with an outburst at any moment. No? Is it just my kids? When Pez browsing is over, there is always a cell phone game. After a bit, I asked the "boys" to put it away though. Meal time is family time as far as I'm concerned. Speaking of family, the girl refused to pose nicely for a picture. After several face twists, she decided on a lemon smile. We all inhaled a basket of fries while waiting for our entrees. 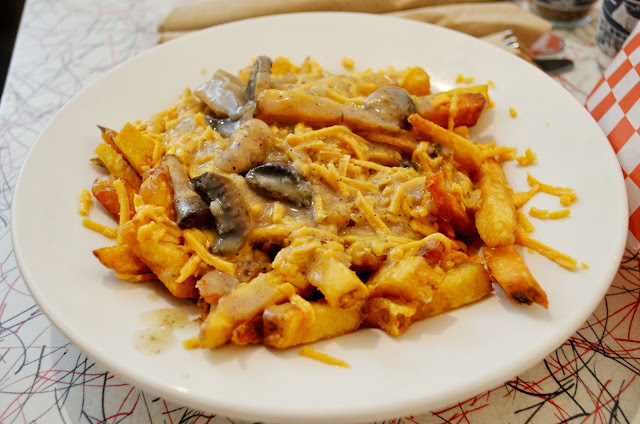 I also had my first-ever poutine - a vegan version with mushroom gravy and vegan cheese shreds. I'm not sure I can go back to regular fries. It was so tasty! I knew the all-day breakfast would be a hit with my girl - she decided on blueberry pancakes with vegan sausage. Gluten-free pancakes are an option too. My husband chose a vegetarian burrito, while our boy chose mac and cheese. 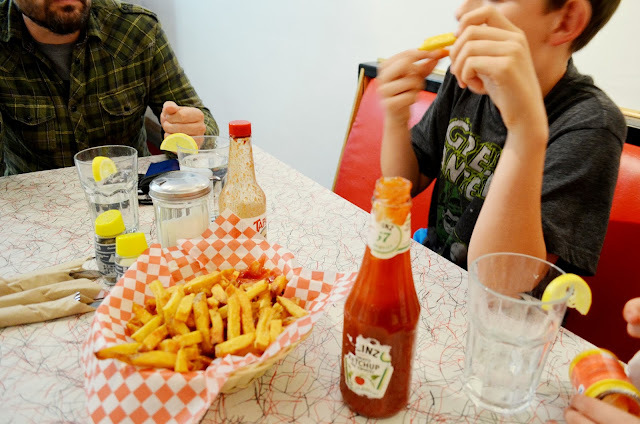 With vegetarian and vegan options, Sadie's Diner easily accommodated us all. I had a cajun tofu quesadilla. 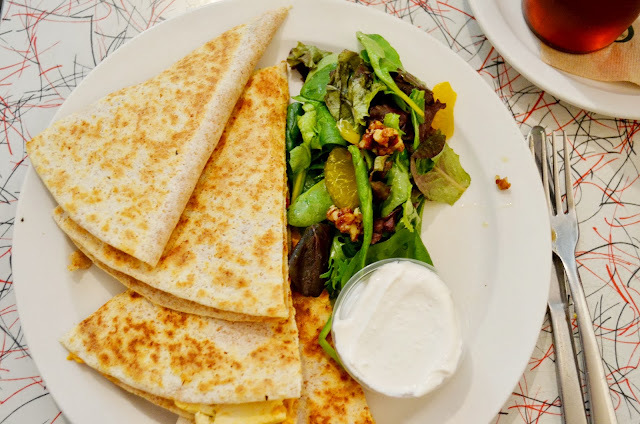 I loved the idea of putting tofu slices in a quesadilla. The cajun flavouring wasn't my favourite, though. I found it a little bit sweet. My husband had a taste and he liked it - spices are very much a personal preference, aren't they? 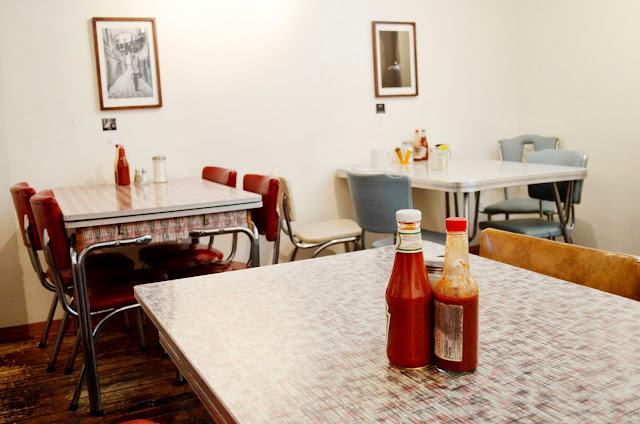 Check out the Sadie's Diner menu - I think it has great ideas that you can try at home. 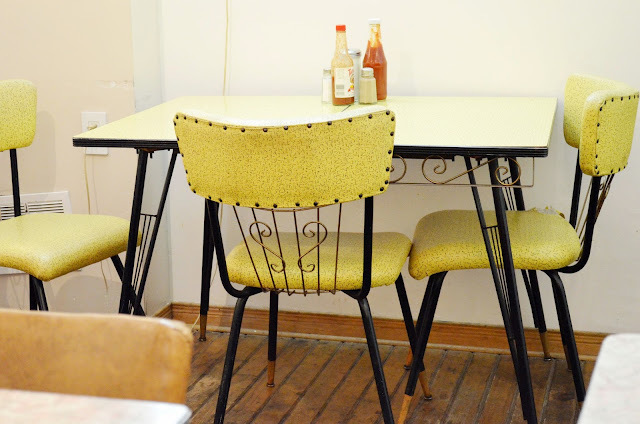 The simple, retro decor makes it a great place for families too. This is off topic, but I want to thank my sister for suggesting I put my literary buttons on my jean jacket. She is much more creative when it comes to fashion. I have a bunch of animal-friendly buttons too. They were sitting in my jewelry organizer when my sister spotted them and made the suggestion. She also gave me the Campbell's soup t-shirt I wore that day. I'm officially making her my stylist. 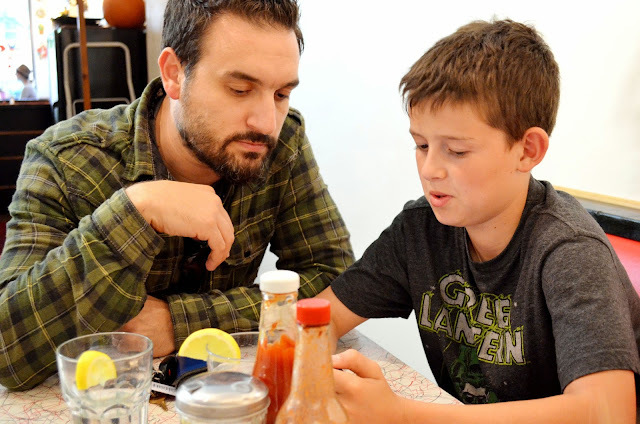 Do you prefer eating out or eating at home? What's your favourite restaurant? 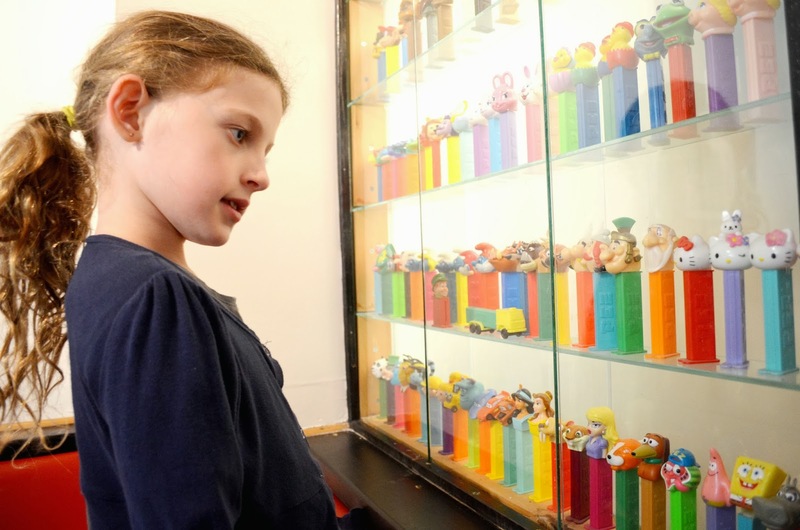 I could make my own Pez wall here - Darcy used to collect them, they're in a Rubbermaid in the basement - that is just the neatest display!! I've never seen anything like that in a restaurant - what a good idea!! Love the table and chairs too!! Carla wears buttons like that all the time - the more - the better!! You should totally make a Pez wall. It would be cool in a basement entertainment area or something. What are Carla's buttons about? Thanks Karen! Big portions are always preferred. ;) I hear ya on the fries - I am getting the larger poutine next time! Everything here is just all so 60's!! Great seating! 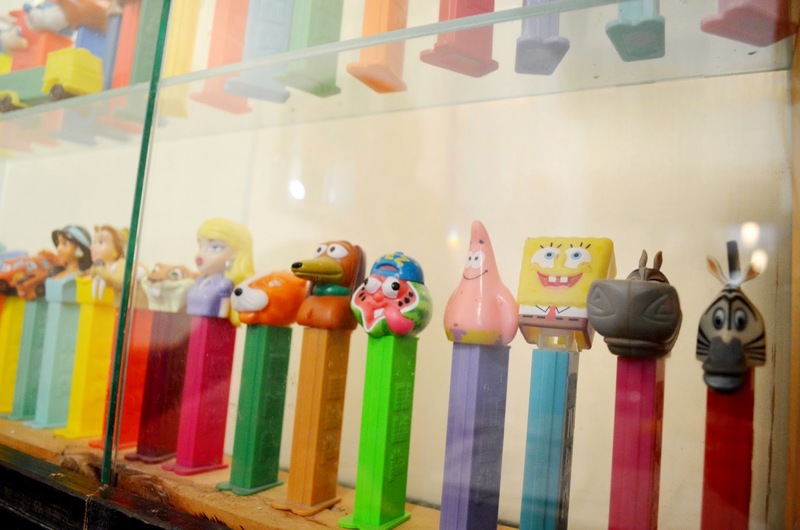 Love the Pez wall. Sounds like you would go back to Sadie's. We have a really nice restaurant here in town that makes incredible entrees. The best part though is that people come in dressed in t-shirts & jeans or dressed up all fancy. They'll even bring out bread dough for the little guys to make dough men, and they bake them in the wood pizza oven and bring them back to the kids ... a fun evening. It's cool, right? :) I would definitely go back...hopefully soon. I love, love, love the dough men idea. What a great way of getting kids involved! Oh I really like going to Sadie's too ... the decor is so neat there! I love the bluebirds painted on the little round tables out front. Simply love the lemon smile! Al here, owner of Sadie's. Thanks for the great revue and posting these pictures. I'm glad you enjoyed everything on your visit. The place looks homey and the food looks yummy. She's a goofy one huh. Hey i love your denim jacket. Looks like a great place to eat. You had me at Pez wall! My favourite candy of all time. Love your tee and buttons, you look great. I didn't get too much into Pez, but now I wish I had collected them!